Who doesn’t love a bit of gardening every now and then? 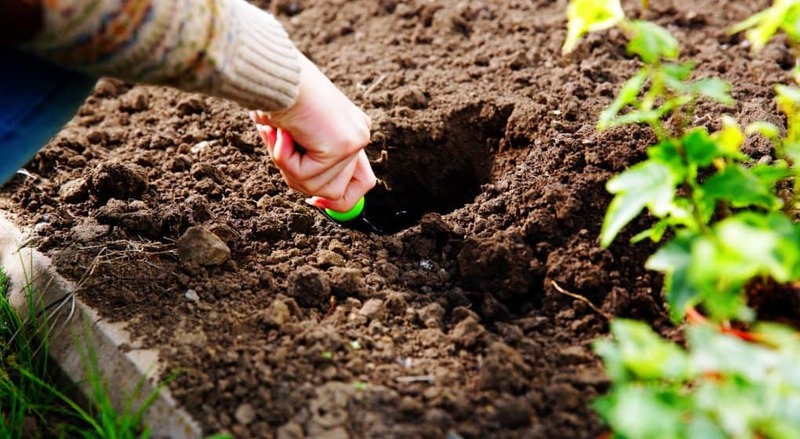 But, whether you’re a serious green-fingered gardener or just someone who enjoys it as a kind of hobby, one thing is for certain - your gardening tasks will be a whole lot harder to do without decent tools to help you out. One such multi-purpose tool that’s seen as an essential piece of equipment for many gardening enthusiasts is the Hori-Hori knife. In this article, we’ll explain a little more about the origin of the Hori-Hori knife, why it’s the preferred gardening tool for so many people, and some of the most popular options available to buy at the moment. This extremely useful tool originated back in Japan where it was originally used to trim plants such as the Bonsai in highly mountainous regions. It’s better known as the Japanese digging knife and while it may have its roots in Japan, a lot of westerners are now beginning to fall in love with it. The word “hori” is the Japanese word for dig, and the word “hori-hori” represents the sound that digging makes. What Can the Hori-Hori Knife Be Used For? Although it’s known as the Japanese digging knife, there are so many other uses for it that’s better to think of the Hori-Hori knife as more of a multipurpose tool. Blade. What’s a knife if it doesn’t have a decent blade? A knife’s blade is the pinnacle part of the tool. The Hori-Hori knife has a specially designed blade that enables it to not only work like a trowel scooping out soil, but the spear-like tip is also very useful for digging into compacted soil. It’s even marked with lines along the blade to help you determine the depth you’re planting at. If you’re looking for sharpness, then that’s not a problem. Traditional Hori-Hori knives are designed to be razor sharp so that they can be used to carry out heavy-duty gardening tasks such as cutting or removing sharp stones and rocks. Some manufacturers even use a special pre-sharpening process to ensure they get the best results. Even if you don’t need a knife that has a sharp blade, you’ll still want one that’s strong and thick and up to the job. Pretty much all Hori-Hori knives are made with stainless steel blades as they’re robust and rust proof, making them perfect for using outdoors. However, some are made of steel. And while these do tend to be stronger than stainless steel blades, they’re more likely to rust over time. Handle. The handle of a Hori-Hori knife is equally important as the blade as is the part you’ll be gripping while you work. For that reason, it needs to be strong and sturdy and not likely to snap in challenging conditions. You will find that most decent Hori-Hori knives have handles that are riveted to the knife for maximum durability. Traditional Hori-Hori knives have wooden handles, but modern improvements have brought about plastic and soft polymer handles too. While wooden handles are invariably stronger, plastic and polymer handles are usually textured. This means they’re both easier to grip and easier to clean. Sheath. Having a good sheath not only protects your knife when not in use, but it also helps protect you from being cut by the sharp blade. Sheaths for Hori-Hori knives are available in various different materials, including vinyl, nylon, leather, plastic, and wood. Both vinyl and nylon are quite light materials which make them good for transporting and for gaining easy access. Leather sheaths, on the other hand, are much more durable and look nicer (in my opinion). Plastic and wooden sheaths are also very effective but are a little more rigid than those made of material. Size. The size of a Hori-Hori knife ranges from around 11 to 15 inches in length, with a blade that typically ranges from 6.5 - 7.5 inches long. Serrated edge. On a Hori-Hori knife, one side of the blade is straight while the other is serrated. Having a serrated edge on your knife is a very useful feature when gardening. 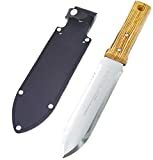 The serrations enable the knife to bite hard into tough materials such as roots, branches, and rope to make cutting much easier. Graduation/measurement marks. These marks are one of the most prominent features of Hori-Hori knives as they’re the only one of their kind to have them. They are engraved measurement marks that lie along the edge of the blade which allows you to accurately measure soil and fertilizer and to ensure your seeds get planted at the right depth. Just make sure when buying a Hori-Hori knife that these graduation marks are deeply engraved and are clear to read. Accessories. There aren’t too many accessories you need for a Hori-Hori knife, but some accessories you may find useful are a knife sharpener and a belt clip. The knife sharpener just ensures the blade on your knife remains sharp and effective, while the belt clip is useful for transporting around the garden. Price. The final thing to consider when buying a Hori-Hori knife is the price. When it comes to these knives, in my experience, you get what you pay for. Your main concern with these knives is getting a strong blade and handle, and adequate serrations to help with the cutting of tough material. As long as you have those features, everything else is a bonus. How long can I expect my Hori-Hori knife to last for? This is a hard question to answer as it really depends on how much you use it and how well made the knife was, to begin with. Typically, you would expect a Hori-Hori knife to last for a good 10 years or so. ​What do I need to do to maintain my Hori-Hori knife? Thankfully, Hori-Hori knives are pretty low maintenance, and as long as you don’t leave them out to rust they should last for years. Give your knife a quick wash after you’ve used it. Then allow it to dry before packing it away. For handles that are made of wood, simply rub them down every now and then with a little linseed oil. This can help prolong their life significantly. When it comes to sharpening the blade, you should always do this at the start of both spring and summer. A sharp blade will allow you to cut through compacted dirt more easily and will reduce the risk of injury while doing so. The Nisaku Hori-Hori knife is very solid and well-made knife that’s been forged by some of the best blade craftsmen in Japan. 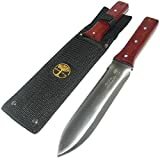 With its 7.25-inch Japanese stainless steel blade, that’s serrated on one side and smooth on the other, you should have no problem at all digging, weeding, cutting, or transporting plants with this tool. It also has a chunky 5.25-inch wooden handle to allow you to maintain a strong grip while carrying out those more challenging gardening tasks. There’s clear engraved graduation markings along the blade to enable you to accurately measure soil and plant your bulbs and seeds at the correct depth. And, it also comes with a leather sheath for safe storage. There’s even a hole in the handle to make hanging in the shed easy. If you’re looking for a Hori-Hori knife that’s high quality and durable but won’t cost you a fortune then be sure to check out this fine example on offer from Cielcera. 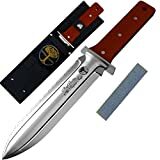 It’s 7-inch, full tang blade is made using 420 stainless steel meaning it’s nice and strong and won’t rust in a hurry. And it even features a crossguard to help protect you from being cut in the event of a slipping incident. Being a traditional Hori-Hori type knife, it’s serrated on one side and smooth on the other, making it the ideal tool to use for a number of different gardening tasks. 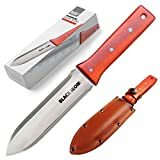 To help maintain the life of the knife, the blade is coated with a lubricating oil to prevent friction while being stored in its leather sheath. It may have a simplistic design, but don’t let that fool you as this Hori-Hori knife on offer from Black Iron Tools is by far one of the most durable and versatile knives on the market. It has a full tang stainless steel blade that has a concave design for improved cutting and digging. And because it’s made from steel it’s rust and corrosion free. The handle on this knife is a good length and made from a high-quality wood, making it both comfortable and sturdy. 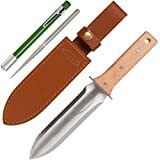 While the heavy-duty leather sheath provided is also very durable and will help keep your knife in the greatest condition. Made from Truly Garden, this multi-purpose Hori-Hori knife just oozes quality everywhere you look. 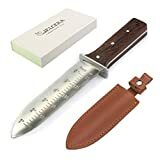 It has a thick, 7-inch curved blade made of high quality 420 stainless steel, a 5-inch FSC certified hardwood handle, and a protective handguard. Even the sheath it comes with is made using thick leather and solid brass snaps. The blade on this knife is extra sharp, however, there is a protective handguard to help keep you safe. Another added bonus with this knife is that it comes with a sharpening rod to help keep your blade at its most effective. And there’s even a 5-year warranty in the rare event it does fail to perform. There are a lot of high-quality gardening tools out there that are both well-made and great value for money. 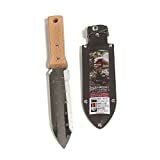 Unfortunately, the Oakridge Garden Hori-Hori Knife is not one of them. While this knife is probably one of the nicer looking models out there, it really doesn’t have too much else going for it, other than the nylon sheath that comes with it. The quality is poor, it’s very lightweight and flimsy, and it’s overpriced. There are far better Hori-Hori knives available at a much better price. So steer clear of this one at all costs. When it comes to choosing a favorite, our number one choice has to be the Nisaku NJP650 7.25” Hori-Hori Knife. It’s made with top quality materials, feels nice to handle, and it’s one of the very few Hori-Hori knives that’s actually made in Japan. 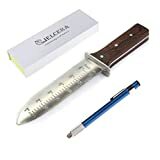 The stainless steel blade is durable and long enough to do most gardening tasks, the engraved markings are clear, and the price isn’t too bad either. What more could you possibly want? We hope you found the above review helpful and informative and are now one step closer to making your next Hori-Hori knife purchase. It really is one of the most useful and versatile gardening tools that’s designed to make your life a whole lot easier. Just make sure you don’t compromise quality for price. Other than that, happy gardening!